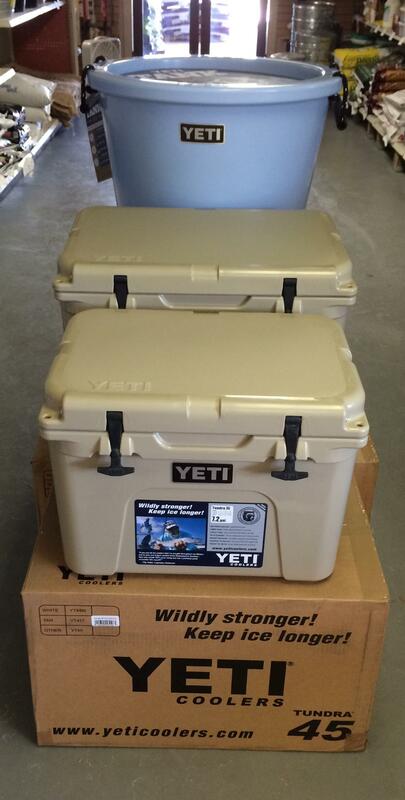 Mansfield Feed Mill is proud to be an official YETI® Cooler dealer. 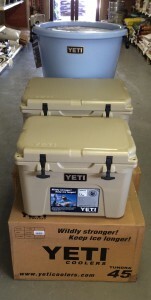 We’ve got the YETI Tank 85 along with the Tundra 35, 45, 50 and 65 coolers in-stock. Whatever your cooling needs, we’ve got the size in-stock! Resembling an ice bucket in general shape only, the YETI Tank is a 20.8-gallon, party-ready beverage tub behemoth that’s as armored as its namesake. The Tank ice bucket is a party animal that can hold 60 longnecks, 96 cans, 1 keg, 51 blue crabs, 24 mullet & menhaden, 98 slices of watermelon, 20 gallons of trash can punch, or 2 bushels of oysters. Whether you are hunting, fishing, camping, boating, tailgating, rafting, or having a barbecue, we have a large cooler range of heavy duty, well insulated, rugged coolers for your outdoor ice retention needs. Mansfield Feed Mill is your authorized dealer of YETI® Coolers! Stop by today and pick one up! This entry was posted on Friday, August 1st, 2014 at 12:41 pm	and is filed under News & Updates. You can follow any responses to this entry through the RSS 2.0 feed. Both comments and pings are currently closed.